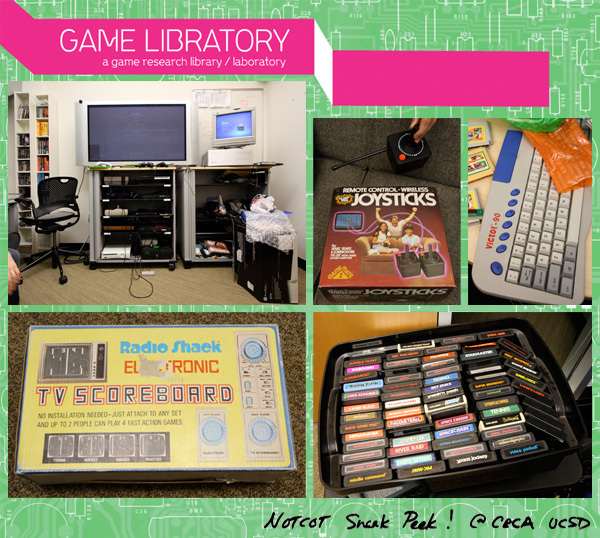 The Game Libratory is a game library / laboratory being incubated at and spun off from Software Studies @UCSD. 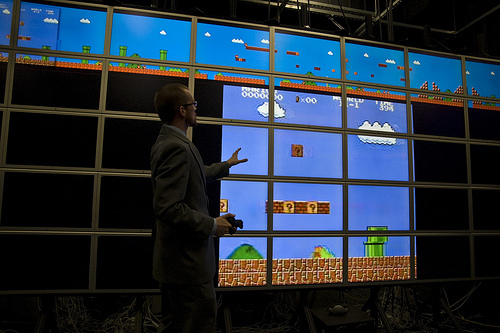 Its mission is to develop new software-based research methods for the study and development of games. Game Libratory holdings include a wide variety of historical and contemporary video game consoles (Atari VCS, SNES, PS2, Xbox360, etc.) running from the 1970s to the present. These holdings are being expanded to provide access to a wide variety of platforms and devices, both historical (e.g. emulated DOS PC computing) and contemporary (e.g. low cost, aftermarket, and edu-tainment console products). In addition, the Game Libratory hosts a collection of console and PC game titles for these platforms, including several hundred original Atari VCS cartridges and several thousand Japanese Playstation titles. The Game Libratory is managed by Daniel Rehn, Derek Lomas, and Jeremy Douglass, with support from the Software Studies Initiative and with facilities generously provided by the Center for Research in Computing and the Arts (CRCA) at Calit2, UC San Diego. Special thanks to Stefan Tanaka of the UCSD History Department and to Sony Computer Entertainment of America for the donation of thousands of title for the Playstation, PS2, and PSP video game systems. The Game Libratory workspace as featured on NotCot. Examining sidescrolling gameplay in the context of level design.